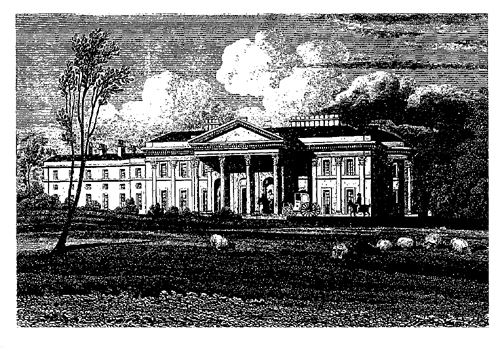 Following the succession of Cecil Weld-Forester to the estate in 1811 a new house was built. The old Hall was demolished by November 1812, though its service and stable blocks survived and were later converted to residential use. Work began on the new site, 0.5 km. to the west, in 1812, and payments to the building workers ceased in 1820. 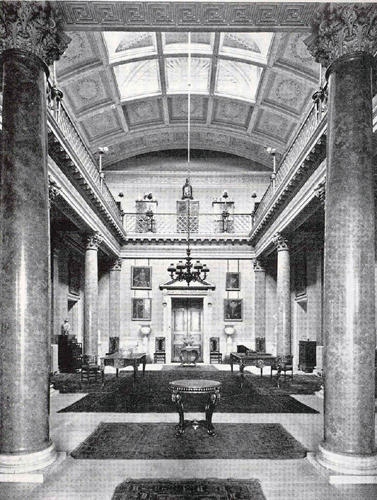 In 1822 the Hall was ‘lately finished’. The architect, Lewis Wyatt, had probably left supervision to a clerk of works. The house stands on level ground overlooking the steep sided valley containing Willey pools and was enhanced by the creation of a new park. The gardens were improved in the early 19th century by the building of more walls and hothouses. In the 1860s elaborate formal gardens designed by W. A. Nesfield were laid out around the Hall. I was asked to advise on appropriate colours for the repainting of the large entrance hall in this magnificent house in Willey, Shropshire .